Chancellor Alistair Darling has doubled the inheritance tax threshold for married couples to £600,000. He also targeted private equity bosses and "non-domiciles" in his pre-Budget report - and pledged to switch green air taxes to flights, not passengers. But he was accused by the Tories - who unveiled policies in all these areas last week - of being in a "panic" after their recent opinion poll surge. 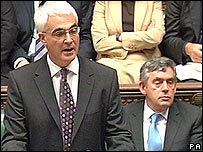 Mr Darling also downgraded the UK's growth forecast for 2008 by 0.5%. At the moment, inheritance tax is charged at 40% on assets worth more than £300,000 that someone leaves behind when they die, unless it is left to a spouse. When the spouse dies the same £300,000 rate applies. Mr Darling has simply made the individual inheritance tax threshold transferable - allowing couples to combine their allowances and so escape tax on the first £600,000 of an estate. The measure will be backdated "indefinitely" - and it will increase to £700,000 by 2010. Analysts say many couples already arrange their tax affairs so that their allowances are combined, meaning the changes may have little effect in practice. The Conservatives promised at their annual conference last week to exempt estates under £1m from inheritance tax. They had also outlined plans to raise £3.5bn to pay for the cut with a £25,000 flat rate charge on "non domiciled" wealthy foreigners. Mr Darling dismissed that idea, saying it would raise £650m before, to Tory jeers, saying he would bring forward his own measures which could see "non doms" paying a charge after seven years. Mr Darling said his inheritance tax proposals would mean that 97% of estates would be exempt while leaving the government with £2bn more to invest in schools and hospitals. But the Conservatives accused Mr Darling of producing a "pre-election budget without an election" - after Gordon Brown's weekend decision not to go to the country this autumn. Shadow chancellor George Osborne said Mr Brown had had 10 years to address issues like inheritance tax. "Now a week after we put forward our plans the prime minister and the chancellor are scrabbling around in a panic trying to think of something to say," he told MPs. And he accused the prime minister of having to wait for the Conservatives to tell him what his vision for the country was. In other pre-Budget measures, Mr Darling announced a crackdown on private equity bosses, saying from next April the government would withdraw the capital gains tax taper relief, which can be as low as 10%, and put in its place a single rate of 18%. "I believe it's right that everyone who lives and works here should pay their fair share," said Mr Darling. The chancellor also announced a £2.6bn increas in central government grants to English local authorities over the next three years, which he said would be enough to keep council tax rises "substantially" below 5%. On the wider economy, Mr Darling said the background to his first pre-Budget report was one of "increased international economic uncertainty and a more fragile global environment". He said the fall-out from the global credit crunch meant UK economic growth in 2008 would be 0.5% lower than previously predicted - but that it would bounce back to its expected rate of 2.5%-3% in 2009 and 2010. He also had to increase public sector borrowing forecasts - expected to come in at £38bn this year, not £34bn. The government's longer-term plans were set out in the Comprehensive Spending Review, which he said "will be tighter for many departments". Among departmental budget announcements he said there would be an extra £400m for the armed forces, including cash for improved accommodation. A new single budget would also bring together the work of the police, the security services and all parts of the government responsible for addressing the threat from terrorism. It will rise every year over the next three years to £3.5bn a year, representing a trebling in cash terms in a single decade, he said, including £700m over the next three years for Home Office anti-terrorism work. On health, he announced a 4% a year rise for the NHS for three years - from £90bn this year to £110bn in 2010. But Lib Dem Treasury spokesman Vincent Cable said this fell well short of the increase recommended by Sir Derek Wanless in his 2002 review. He asked Mr Darling: "Will he confirm that when the Wanless report appeared, Wanless argued that 4.4% growth was the absolute minimum required to sustain improvements in patient care? "And that was on the assumption that the maximum degree of health service reform was achieved, which it clearly has not."